One of the cheapest medium format SLRs made, the Kalimar featured a quiet, cloth focal plane shutter and a true instant-return mirror in a system with lenses from 52mm (at the time, the widest medium format SLR lens in the world) to 300mm. And if that isn't enough, the camera was designed by the famous German designer Heinz Kilfitt, who is also credited with the design of the Berning Robot and the Kilfitt Mecaflex! 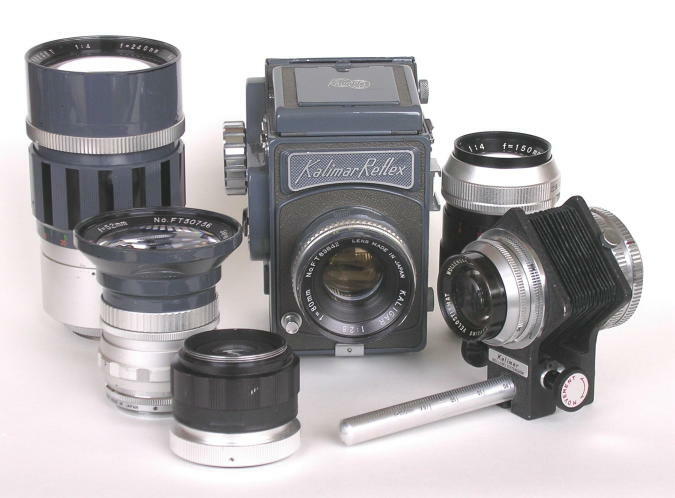 When the Kalimar Reflex appeared in 1957 (an upgrade of the short-lived Soligor 66, which was itself an incarnation of the Fujita 66; all were manufactured by Fujita Optical Company), it was Japan's only (although not first) 2 1/4 square SLR. Worldwide, its competition consisted of the Hasselblad 1000F (about to be superseded by the new 500C), the 1954 Exakta 66... and not much else. 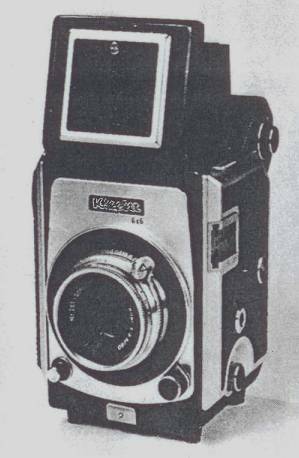 The original Bronica was not to appear for another two years, with the Kowas, Noritas, etc, following in due course. The Praktisix would not arrive in the US until 1962. It's an uncomfortable thought that, at a time when Nikon and Canon were beating Leica and Contax about the head and shoulders, Graflexes were being manufactured by Kowa and Mamiya was poised for an assault on Rollei with its new interchangeable-lens TLR system, Japan's reputation in the 2 1/4 square SLR arena was riding on Kalimar. Before we despair, however, let's take a look at how the Reflex stacked up against its contemporaries. The Kalimar Reflex, appropriately enough if you're familiar with Kalimar, made no pretense at being a Japanese Hasselblad. Its shutter speed range went only from 1/25 to 1/500, for instance, against Hasselblad's 1 to 1/1000 and Exakta's full 12 seconds to 1/1000. Perhaps more like a 'single-lens Rolleiflex' than a Hasselblad, the vertical-bodied Kalimar had no interchangeable film magazines, no prism finders, no interchangeable screens or self timers. It had no auto-diaphragm lenses either, but neither did anybody else at the time. This humble entry-level 120 SLR was not entirely without impressive features, however; the most obvious of these becomes apparent the first time one uses the camera. After winding the clickety, ratcheted film advance knob until it stops, opening the finder and focusing on the bright, Fresnel-lined groundglass and fiddling awkwardly with the stiff, narrow preset ring, you depress the Rolleiesque shutter release button and the shutter fires with a soft, reassuring, immeasurably-quieter-than-Hasselblad "klerwhook". Staring down into the hood, you see the focusing screen turn a blank frosted-silver color, and then… Land O' Goshen! Instantly, the image reappears on the screen! Can it really be that this homely, bare-bones camera had an instant return mirror, only three years after the Asahiflex and two years ahead of the Bronica? Was this the first medium format SLR in the world with an instant return mirror? As it turns out, no: Kalimars made before 1960 had a not-quite-instant return mirror operated by the shutter release plunger. By the time the instant-return Model SQ came out in 1960, Bronica had beaten it by a year. 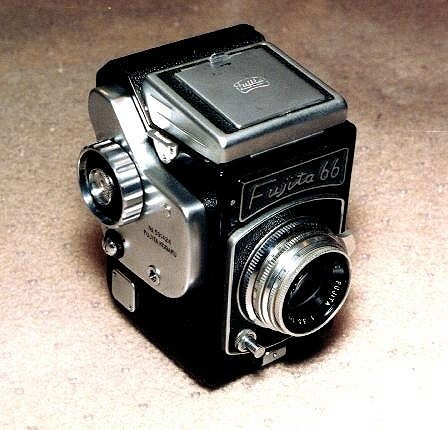 This Fujita 66 of 1958 is identical to my Kalimar Reflex SQ of 1960, except that it lacks the instant-return mirror. Most of the Kalimar's other features were pretty ordinary stuff: a semi-semi-automatic frame counter that requires you to line up the arrows on the film and manually reset the counter with a little button that has the annoying habit of getting bumped and resetting the counter (and ruining frame registration) in mid-roll; FP and X synchronization; a one-touch viewing hood with a little flip-up magnifier and a peepsight sports finder; a front-mounted shutter release with a Leica-threaded cable release collar; and a 44mm screw thread lens mount. Behind it all a vertical cloth focal plane shutter provided speeds from 1/25 to 1/500 (generally wildly inaccurate, at least today on old examples). Later models (SL, SQ and 660) added a separate slow-speed device (no gears, just a flywheel) to extend the range down to an equally inaccurate 1/5, and the last "Model Six Sixty" added an interchangeable prism finder and a split image screen. Not a Hasselblad, but not bad for a camera that sold new for under $100 in the late fifties. But there's more to a camera than the body, and the Kalimar's lenses provided a surprise or two as well. The normal lens was an 80mm f/3.5 triplet of quite adequate performance. Its mount was very awkward to operate, though, and the later Tessar-type f/2.8 offering was a great improvement. Also offered in 1957 was a decent 150/4.0 short tele, an unusual 5-element design in which only the front four moved during focusing; but the big news was the wide angle. At 52mm, this was the widest lens available for a 2 1/4 square SLR anywhere in the world! 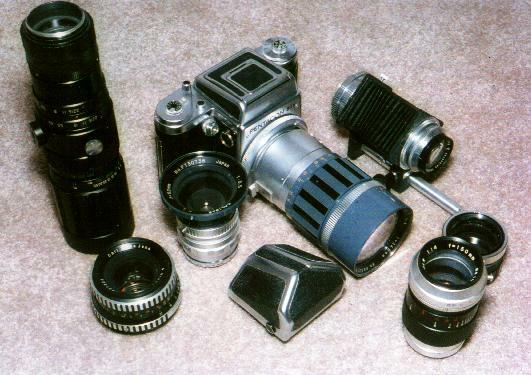 Adapters were made to fit it to the Hasselblad 1000F, and the combination of 52mm Kaligar and Hasselblad adapter remains a highly desirable item among collectors today. There was a particular reason why the Kaligar was the widest lens of its day: only about three years after the famous 35mm Angenieux Retrofocus, the 52/3.5 Kaligar was the first retrofocus design lens for medium format. 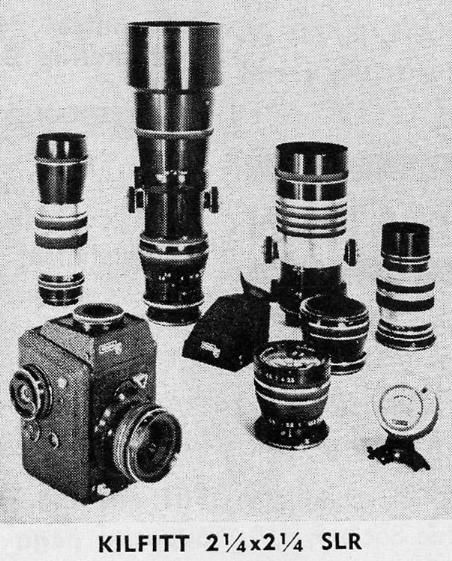 In addition to making wider angle coverage possible in an SLR, the retrofocus design provided improved corner illumination and made higher apertures possible - and it pointed the way to the future, as this concept would become the basis of the tremendous development in wide angle lens design that would follow over the next two decades. The only hard evidence I've seen to support the Kalimar/Kilfitt connection, the family resemblance is clear in this photo of the Kilfitt SLR system from a contemporary magazine. In this photo, which appears to be a bit earlier than the one above, the Kilfitt name and the resemblance to the Kalimar (including the distinctive Fujita 80/3.5 lens) are clearly visible. I've never met anyone who's ever seen a Kilfitt in the flesh. Although not intended, there is one other characteristic of the Kalimar and its lens system that has been of great interest to me: the 44mm lens mounting thread is nearly identical to a Series 6 filter thread, and also to the screw thread used in 35mm Mirandas of the same vintage (the Miranda thread pitch is slightly different). Some Miranda "T" mounts will, in fact, thread right into the Kalimar; others can be persuaded with a little filing. Starting with a low power Miranda teleconverter and shifting the lens cell forward in its mount (many of these are a screw-in cell that is easily adjusted in this way), it is possible to make an adapter that will permit the mounting of nearly any "T" mount lens on the Kalimar with full infinity focus and full coverage of the 2 1/4 square negative! The magnifying power of the teleconverter increases as the lens cell is moved forward: my adapter began life as a 1.5X converter and now provides 2.5X on the Kalimar. The Kalimar has two main faults beyond its limited and not-too-accurate shutter: first, its mirror has a tendency to hang up in cool weather; and second, there is one part in the wind mechanism that consistently wears out, to the extent that parts cameras are unlikely to be much help for repairs. For this reason, I obtained a Pentacon Six, which has none of these vices (although neither does it have an instant return mirror), but its fine Zeiss lenses are a bit expensive. It is, however, a relatively easy machining job (as proven by the fact that I managed it) to make an adapter to mount Kalimar screw lenses on the Pentacon Six. By this expedient I now have (including the "T" mount options) a Pentacon Six and a set of lenses including a bellows, 52, 80, 150, 240, 340, 750 and 1000mm, a 2X teleconverter and a 225-575mm zoom. And I still have the Kalimar body as a backup, just in case. Got a Kalimar that needs repair? Take a look here.